Organic fresh fruits and vegetables should be the major players in all of our diets. Rich in fibre, vitamins, mineral, antioxidants, phytochemicals and more, these superfoods offer us health, wellness and vitality with minimal risk of the negative side effects that pharmaceutical interventions may pose. Whether you have a mild case of the winter blues or you just want to have more energy, clear skin and a happy gut, juicing can be an easy way to harness the nutritional power of fruits and vegetables. We offers 5 easy recipes to get you started on the road to wellness. Juicing is a great way to start your morning, give yourself a mid day boost or even substitute as your late night snack. 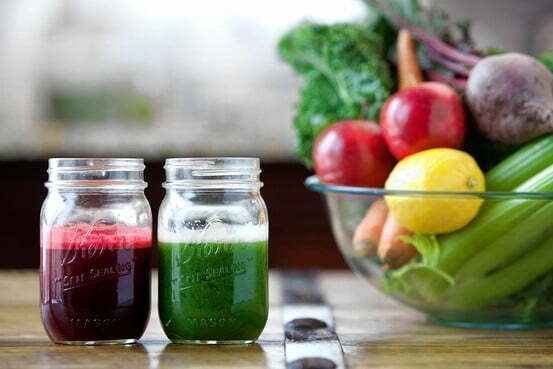 Our juices are simple, easy to make and incorporate nutrient-rich. We encourage you to try them as they are but as you get a sense for the flavours you like, feel free to substitute ingredients for what is at hand or flavor combinations that pique your curiosity. With Carotene and loads of Vitamin C, this is the perfect sunny juice for a gloomy day. Juice of 1/2 lemon (stirred in at end) Note: If you can find Meyer lemons, they are sweet, fragrant and beautiful for juicing. Berries top nearly any superfoods list offering a host of health benefits and most people agree, they taste great! The pear and cucumbers make for a bright and energizing flavor combination. The kale and celery add green power. ABC juice is great if you feel a cold coming on. With all bases covered, ABC juice may knock out that cold before it gets a foothold or replenish yourstores of vital nutrients to help you get better quick. Compounds called anthocyanins give fruits and vegetables their vibrant colours. These same pigments also act as powerful antioxidants.